Beets come in different colors, from white to dark red. A single beet has only 35 calories and no fat or cholesterol. It provides 2 g of fiber, 1 g of protein, vitamin C, iron, calcium and folate. Beets also clean your blood and aid your liver, according the vegan chef and nutrition consultant Patty Knutson. You can eat beets raw, or there are numerous ways to cook and enjoy them. Regardless of the cooking style, you usually check to see if they are finished cooking in the same way. 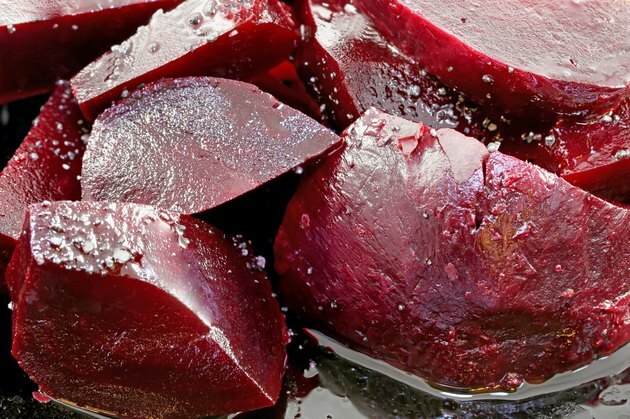 Clean the beets with a paper towel, but not with water, for baked beets. Cut the roots and stem off and bake the whole beets in a baking dish covered with foil. Bake them at 400 degrees Fahrenheit for one hour. For this method, insert a fork into the beets. When the fork goes through easily and the inside is tender, the beets are done cooking. Cut the stem and roots off for boiled beets; it is not necessary to peel them. Boil water, add the beets and turn the heat to low. Cover and simmer them for one-half hour to two hours, according to the size of the beets. You will know when they are finished by inserting a fork; it should go through easily. You will also be able to easily slip the skins off; you can test this with the fork when they are still cooking. Cut the beets in quarters to cook them in less time. Heat a few tablespoons of water, vegetable broth or chicken broth in a frying pan over medium heat with the lid on for sautéed beets. Peel and dice or chop the beets and add them to the pan. Cover the pan again and stir the beets once in a while. Let them cook for five to 15 minutes. Again, test to see if they are finished by inserting a fork to see if they are tender. Add more broth if you need to keep cooking them and the broth is gone. Peel and slice or chop the beets for steamed beets. Add them to a steamer and let them cook for five to 15 minutes. Poke them with a fork to see if they are tender enough; they will need longer cooking the thicker you cut them. If you want to serve them whole, cook them for 40 minutes to an hour.